I recently had the opportunity to try out — a jewelry membership service dedicated to making your life easier and more stylish. Their goal is to make accessorizing with jewelry fun again. As someone who likes to look nice and presentable, but who is by no means a fashionista, I wasn’t sure what I’d think of this service. It seemed a little quirky (renting jewelry?? Who does that?!) and expensive to me (I’m all about buying jewelry for $3 off the clearance rack at Kohl’s!). However, because I’ve seen this advertised multiple places and because I know that you all enjoy it when I try out services and write completely honest reviews, I decided to go for it and then give you a really truthful look at my experience. 3. Add pieces to your Wish List. This is a way for your stylist to get a better idea of your likes and dislikes. They recommend that you add at least 15 pieces to your Wish List. Your stylist will do their best to choose at least one piece from your Wish List to include in your box. 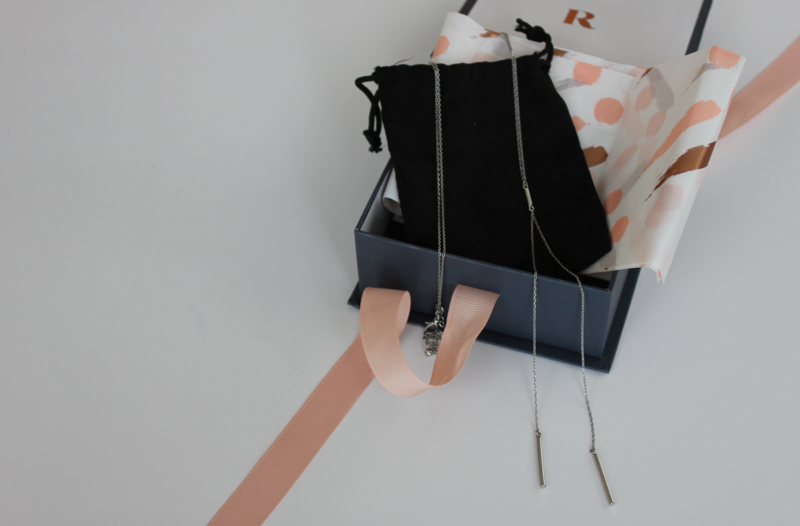 Rocksbox sets are curated for you based on your Style Profile and your Wish List. 4. Within a week or so, you’ll receive a box of jewelry. Your box will contain three different pieces of jewelry. You can keep this box of jewelry for as long as you like. 6. You can keep and wear your Rocksbox pieces for as long as you like. You can return your box anytime, as often as you like, and they’ll send out a new set right away. You pay the same monthly membership fee $19/month) regardless of how often you exchange your box. 7. You can purchase any of the jewelry you receive at a discounted price. You’ll get a $10 Shine credit every month that you can use toward the purchase of the jewelry. This credit does not roll over each month. Be sure to add jewelry to your Wish List. I added 15 pieces of jewelry to my Wish List before I got my first box. My stylist chose the bracelet I had picked out and created a set of jewelry around that. 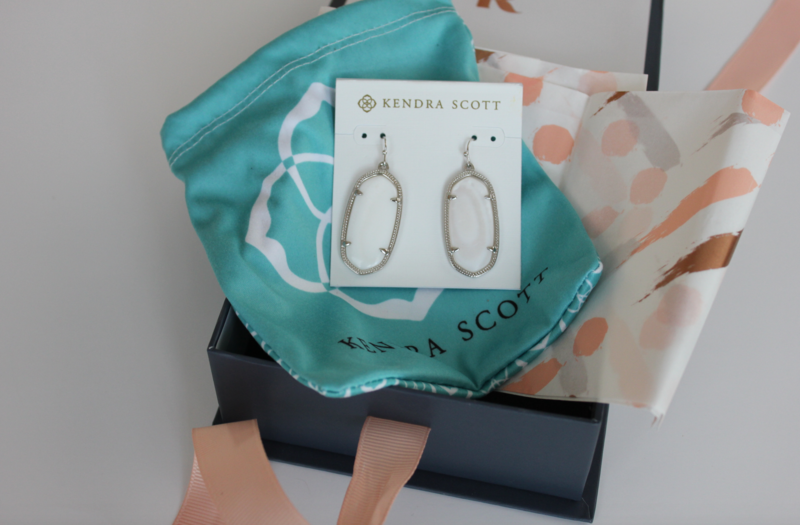 Once I saw what was in my first box and fell in love with the Kendra Scott earrings, I added quite a few more Kendra Scott items to my Wish List for future boxes. Be sure to leave feedback for your stylist. Just like Stitch Fix, stylists depend upon your feedback to make your future boxes as tailored to your style as possible. Once you receive your box of jewelry and wear the jewelry, be sure to log onto Rocksbox and share your feedback on the pieces you were sent so your stylist can get to know what you like and dislike. *Note: In case you’re wondering what happens if you damage a piece of jewelry, here’s what their site says: Your membership includes a small insurance fee, which covers normal wear for all products. If there is slight damage or wear (e.g. lost earring back, a stone falls out, etc.) this is fully covered. However, we will evaluate the damage when it is returned to the warehouse, as excessive damage is not covered. If you have any damage or loss issues, don’t worry, but please email us immediately at [email protected]. You can get the first month FREE! Get an absolutely FREE month when you and use my code moneysavingmomxoxo. Just please put a reminder on your calendar to cancel the subscription before the 4 weeks is up in case you decide it’s not for you. I’d hate for you to get charged for something when you expected it to be free! It’s great for people who need to be on camera or stages every week. If you’re someone who does a lot of video or media or public speaking, this might be a great option for you. For just $19 per month, you can get new jewelry to change up your look on a regular basis — without needing to go out and go shopping for jewelry. I love how jewelry can transform the look of outfits! It gives you the opportunity to try new looks and styles. I absolutely adore this new bracelet I got in . I never would have thought I would like this style, but I really do! I also really liked the Kendra Scott earrings they sent in my box (see below). It’s expensive. You knew I was going to say this, didn’t you?? 😉 As someone who usually gets her jewelry from the clearance racks at Kohl’s and Versona and who tries to pay less than $5 for every piece of jewelry, the thought of paying $19 per month to rent jewelry is just, well, a LOT of money. Other people wore the jewelry. This might not seem weird to you, but for me, it was a little weird to think that I’m wearing jewelry that there’s a good chance someone else wore. They say that it’s sanitized and it looked brand-new to me, but still. You might break or lose it. This is probably one of my biggest hesitations for this service. As a mom of kids, stuff breaks at our house. It’s just inevitable. And I had to be extra careful to make sure I put all the jewelry straight back into the box it came in so I wouldn’t break or lose it and then get charged for it. You can’t use your credit toward your membership. This might not be something you care about, but I always look at the referral programs that companies offer. Rocksbox does offer a referral program — you can get a $25 credit for every friend you refer who signs up. However, they limit the number of referrals to 3 per month. Also, you can’t use the credit toward membership. The credit can only be used toward jewelry purchases. Get an absolutely FREE month when you and use my code moneysavingmomxoxo. Want more information about Rocksbox? You can to see what was in my box and hear more about my thoughts on it. Have you tried Rocksbox before? If so, I’d love to hear your thoughts on your experience with it. Crystal, Have you tried ThredUp? I was wondering if it might be a good option to try. I have and definitely have had good experiences with it. I’m working on a Completely Honest Review post of it and should have that done in the next few weeks! Like you, I am also a frugal mom who buys little or no jewelry. I also fell off the fashion train a long time ago… I’m just not trendy. 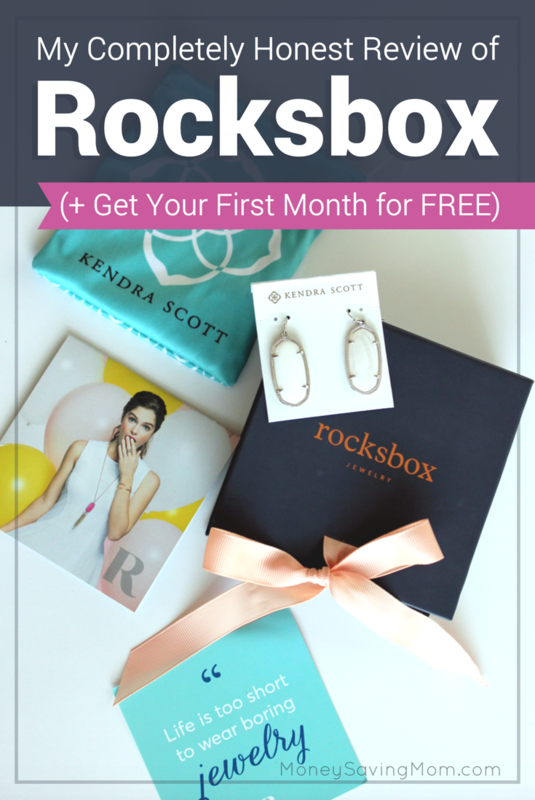 I saw that you were offering one month of Rocksbox for free , so I signed up. And I came to the same conclusion: too expensive. I’m not into name brands and I don’t go to fancy parties often so I don’t have a need for it. Please note, you must cancel your subscription within 4 weeks so that you don’t get charged for a second month. Have you considered signing up for the earring or bracelet of the month club from Fair Trade Friday? It’s $11.99 a month and supports women who live in extreme poverty. The pieces are all different. LOL! Now that I think about it I totally signed up after I saw the picture of you in that apron! Is this a rental like rocksbox or is the fee to purchase the jewelry? @Sarah it’s not a rental. You pay $11.99 (or $31.99 if you want the big box that comes with 3-4 items) and that’s it. You keep what you get. I do tend to lose interest in pieces after a short time and love to switch up my looks regularly, so I do see the benefit of being able to do that with this service. It’s just not reasonable for my budget at this time. Thank you for allowing the opportunity to try it Crystal! I tried the free box, too. The pieces they sent didn’t look like they were worth the stated price. I thought my $10 credit was going to go a little further! It’s not for me, unfortunately. Thanks so much for sharing your review! However, I am terrified that I am going to lose or damage the $72 necklace so I haven’t worn it yet. 😉 I will, but then I’ll cancel. And I love Versona, too! 🙂 I’ve never seen anyone outside of SC mention it so I wasn’t sure where all they had stores. I’m an assistant principal, and, as a result, I need to look very put together every day. I embrace a wardrobe in high quality basics to give myself a polished look without spending a lot of money for the look I’m getting, but I’m often lacking in the jewelry department because I have a hard time justifying spending money on accessories even though it makes the outfit. I just signed up, and for me, this could be worth the $19.00/month. I can’t wait to get my first box! Yay!! That makes me so happy to hear! Just wanted to say that I don’t think you’re weird for having reservations about the jewelry being worn by other people! That was the first thought that popped into my head. I especially don’t want to wear earrings that have been in other people’s ears! YES! That was exactly my first thought, too! I love that you mentioned Kohl’s clearance jewelry because that’s where much of my jewelry comes from. I’ve never been much of a jewelry girl, my husband does appreciate that around Holiday time, and I really prefer unique costume jewelry pieces that I don’t have to worry about them being broken or lost. I have very few ‘real’ pieces of jewelry, my wedding ring, engagement ring and two pairs of earrings that were bought as gifts by my husband, that I wear regularly. Everything else I would just prefer it to be cheap and cute. I don’t think this service is for me. Thanks for taking the time to review it. Great review! And I left this comment somewhere else accidentally but you can get a piece of Kendra Scott jewelery 1/2 off in her store during your bday month. Or your husbands. Ha! I love her stuff. Nordstrom also has nice stuff on their big sale right now and some KS stuff. Just wear what makes you happy. ? You can get half off a piece of Kendra Scott during your husband’s birthday month too? Thank you so much for this review on Rocksbox! I’ll start off by saying that I adore Rocksbox! They have this cool feature where you can have your own personal stylist work with you to meet your “accessorizing” needs, which I love. My stylist is great! I believe her name is Lisa. I also had some reservations on renting jewelry but I’ve found it really does work for me since I work in retail and accessorize for work everyday. I mostly love that I can try things out without having to fully commit to them and then being stuck with something I don’t actually love. As for pieces that have been damaged, Rocksbox really does have a great policy, they don’t charge you if something breaks, you just have to simply return it (broken)… this was told to me by customer service. I’d say I’ve learned that I get the most out of my subscription by keeping my boxes for (roughly) 7 to 14 days and then shipping them back. So, do we keep what we get the first month or do we have to send it back? I’m not understanding this. If I cancel my membership, do I send the jewelry back? I am very interested however I would like to know approximately how much the pieces are to buy. I cannot seem to find that anywhere. They vary in prices. Most necklaces are at least $50+. Same with bracelets and earrings the cheapest are at about $32. The most expensive piece I gave seen were about $120. Hope that helps. I wish I had read this blog sooner to have gotten my first month free, but no matter. I just started my subscription with Rocksbox and so far I’m loving it! It’s a little different now since the credit is $21 not $10 like it used to be. I was a little confused at first because they said I could wear the jewellery for as long as I want before returning it, but that was cleared up by my stylist. I do think this is a little expensive but worth it nonetheless. I am a sucker for rings so Rocksbox really gives me choices and variety to try and experiment with different types of jewellery. I do plan on keeping my subscription for a few months and my first box has a lovely ring that I plan to buy because I just can’t say no to it ? This is really perfect and convenient for women who want to try out different things but don’t really know what they want or don’t have the time to go out and shop for jewellery. So I recommend people to give this a shot and see how they like it. It never hurt anyone to try ? So how long is “as long as you’d like”? Because that’s the most confusing part to me! I just got my first free set yesterday! This is perhaps a silly question, but do you get to keep the box itself and the little baggies that come inside when returning the set? Or do you ONLY send the jewlery? I send everything back — you can re-use the envelope they send you to send it back. How does the return shipping work? Do they provide a pre-paid envelope? It’s free to send it back. I do not recommend using this! I had issues and sent them emails and no one ever got back to me. They seem to only be focused on getting shipments out rather than taking care of current customers. Great review 😉 Now I feel like it’s too expensive for second-hand jewelry. Did you try other ones? I saw an advertisement of mustbmine box… But not sure are they really good. I tried rocksbox for a year, and found that while I liked the fashion and variety, that the jewelry was way too expensive for the quality. When I buy a 125 dollar necklace with stones, I expect that half the stones won’t fall out within 6 months. It’s also really hard to cancel- you gave to call them during limited business hours. I have had the worst experience with this company and still trying to cancel my membership but can NEVER get anyone to help me with this. I have had NOTHING BUT ISSUES since my first box. I purchased a piece of jewelry and it broke the very next day. They replaced it without question, so I was happy. Then I moved last month and told them to change the address- never got a reply until a week later when they told me it was returned to sender. I then told the person that I moved and needed my address updated. They took a few days to get back to me and by then I just decided I would rather cancel and save money to put towards my new house. Instead of canceling, they go ahead and resend the package, which now I have no idea where it was sent to and when I emailed (tried calling but always get voicemail which no one ever returns my call) I did not get any response and it has been almost a week since anyone has gotten back to me. the jewelry is expensive yet I feel like it is cheaply made. Looked at other reviews and I am not the only one who has been dealing with trouble canceling their subscription and getting people to respond to them. Yikes, Jennifer! I’m going to ask our to look into this and fix this for you — I’m so sorry! I just checked on this member and she has been successfully cancelled so that is resolved – I’ll work with our customer delight team to dig into this further and see what may have happened. Thanks for the great review! Can we keep the actual box (it’s so cute!) Or do we need to send the pouches and box back? I always send the box back. I had a very bad experience with Rocksbox. I ordered ONCE and they kept charging me for a year and a half. I’ve tried to cancel but they keep charging me $21 every month. I would not recommend Rocksbox. The jewelry quality is poor and you can’t cancel your subscription easily. Do not sign up. Can you email me? I’d like to put you in touch with them to see if they can resolve this for you. I’ve not heard of this happening to anyone else.